The deathly silence of space was shattered by the distinctive whine of laser fire skittering across his ship’s bow. Jacob spun his Talon into a desperate barrel roll in a vain effort to evade the Night Hawk on his tail. He twisted right, left, and then looped about, losing his pursuer and instantly finding himself staring at a new foe, nose to mirrored-cockpit nose. Fighter pilots never get a break. Blast into the Next Millennium! Silent Death: The Next Millennium is an exciting, quick-playing, and easy-to-learn game of star fighter combat set against the backdrop of an disintegrating high-tech empire. The universe of Silent Death: TNM is our own future 9,000 years from now. Space travel is common for those species that hold the technology, and humans have come to live on hundreds of worlds across the Orion arm of our galaxy. Silent Death was first published by Iron Crown Enterprises (ICE) in 1990. Derived from the successful Bladestorm! tabletop fantasy skirmish and mass battle rules, Silent Death was a fast-playing and easy to learn boardgame of space fighter combat in a very distant future. The original rulebook for Silent Death was a modest 32 pages, with twelve different ships presented for play, a small number of optional rules, scenarios, ship bios, and some small smatterings of background information including some full color graphics on the inside covers of fighter unit uniform patches. The original deluxe set included the rulebook, ship display sheets, an assortment of metal miniatures, flight stands for each, diecut color counters, a simple paper hexmap, and dice. 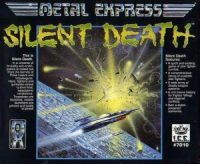 Add a Review for "Silent Death"